Baltimore is a terrible city. Like really terrible. It’s not just the slums that The Wire show. It’s not the fact that if you walk 3 blocks off of the Inner Harbor you are liable to be knifed. It’s the terrible native Baltimoreans that truly believe their city is a great city – the greatest city. Their slogan is “the city that reads”. BIG DEAL BALTIMORE! We are America’s Finest City. With or without stupid reading. People in Baltimore talk your ear off about how great Natty Boh beer and Utz chips are. NEITHER ARE MADE IN BALTIMORE. They aren’t even made in Maryland. 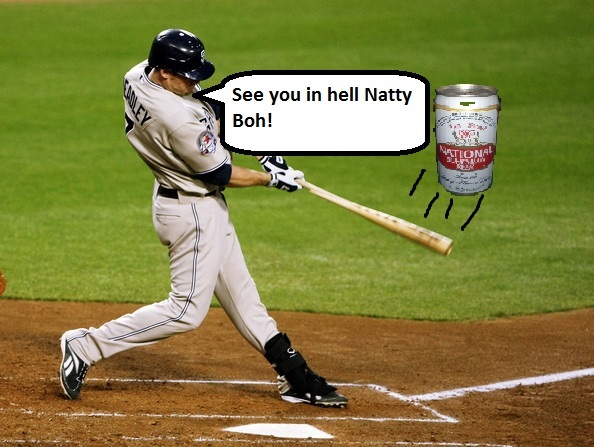 Natty Boh is brewed in North Carolina and trucked into Baltimore so their 12 IQ residents can enjoy that swill. Just a terrible place. Anyways, the Padres are set to thoroughly crush the stupid Orioles in their stupid stadium. And it’s a morning game! The best kind because that means I can ignore my job and listen to the game.